Click here to listen to Three Remarkable Indian Saints if you do not see the player above. The podcast length is 27:15 minutes. The next heart-treasure I want to tell you about is Swami Sivananda-Hridayananda of Sivananda Ashram. Her name means Bliss of Sivananda’s Heart, and it was very appropriate. In the ashram she was simply known as Doctor Mother because she was an eye surgeon and presided over the free eye hospital Swami Sivananda had established in the ashram. Doctor Mother had been born in Madras State (Tamilnadu) as had Swami Sivananda. She told me that when she first learned to speak her grandmother taught her that the moment she awakened in the morning she should say: “O Lord, I am thy dear one; be with me this day.” And so she always did. She was born loving temples and worship of God. Being outstandingly intelligent and having a heart embracing others, she became a very successful eye surgeon in a clinic of her own. She was married to an equally dedicated and spiritually devoted man and had two daughters. How she discovered Swami Sivananda through his books, began corresponding with him, and eventually met him at Sivanandashram, in time becoming Swami Sivananda-Hridayananda. How she inspired others by her regal yet inward appearance and her devotion to Swami Sivananda. How we became acquainted, and how she eventually visited our ashram in America. The next holy one was absolutely unique in my experience, both awesome and wonderful. I have no idea what her name was, and you will see why. I was staying out on the plains of Bengal in the ashram of Swami Vidyananda Giri which bordered a classical Bengali village such as has been in India for thousands of years. Every building was made of mud-plastered mud brick, a virtually indestructible substance, and beautifully thatched. “Time” had not touched it. There was no electricity and no running water. Was I ever glad. The fake advantages of the West are far more hindrance than help. I was leaving in hope of finding Anandamayi Ma whom I had not yet met. (Mataji frequently disappeared with only one or two companions and would only be found when she wanted.) So I made my farewell to Swamiji and went out to the dirt road that ran in front of the ashram. Right at the road there was a three-sided wood structure about five feet high so anyone had to bend down to get inside. Inside I saw a man in a corner cooking something and there were three or four benches. It was a roadside restaurant! Hearing those words I was actually afraid. Somehow I knew that this woman was identified with Parvati, the wife of Shiva, daughter of King Himalaya. This is not uncommon in some forms of devotional sadhana in India. I could feel the woman’s power and understood that I was in the presence of a true yogi–even though I had not yet looked at her. The jibing of the men increased and suddenly she pushed past me and went out into the road where there were many large rocks awaiting use in repair of the road. Squatting down she grabbed two handfuls of the rocks, threatening to throw them. But I could tell that she never would. Peace enveloped her like a cloak. They stopped laughing. She looked around and mumbled something. Then she looked at me and spoke. Mentally I replied: “I am sorry, Mother, but I do not know Bengali, only English.” “Oh,” she said quietly. Then looking at me steadily she began silently questioning me about myself, and I could understand her meaning. So I answered mentally as she looked at me intently. She seemed satisfied, but I realized that I should not let this chance escape me. 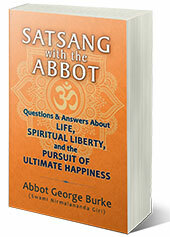 “May I ask you about sadhana?” I inquired mentally. She nodded. And I began asking her advice about my spiritual practice. She told me many things. When I had no more questions she looked at me quizzically, then stood up and walked on down the road with great dignity. Just then the bus came so I got on and spent the four-hour ride into Purulia (which was only fourteen miles away) thinking of her and wondering whom I had really met. The very next morning I went just after dawn to the lane where the bus to the village of Lakhanpur in the Purulia district where he lived would leave. Since I love India I have enjoyed every moment riding through the countryside. Everything I see enters my heart. As a consequence the ride to Purulia was literally wonderful–truly full of wonder. In Purulia I got on a rickety bus that was truly headed for the Last Roundup. And soon. But four hours later it dropped me in front of the ashram gate where two boys of the huge school run by Swami Vidyananda were waiting for me. Swamiji administered several schools. In Lakhanpur he had a school for five hundred boys and a school for three hundred girls, and planned within a year to start a college for women. My newly-met friends took me in through the gate. Far ahead I saw light from a modest building which was the guru mandir-satsang hall. As I came up the steps I was met by a man with the most radiant eyes I have ever seen. When he took hold of my hands I felt as though I was being touched by spirit, not flesh. He greeted me lovingly and quietly. And from then on I, too, knew a perfect sadhu. Swami Vidyanandaji lived in a small room off the temple which was furnished with one wood platform bed, a small wood table/desk and two simple wood chairs. He had two changes of clothes and a chaddar. That was all. Vidyanandaji actually lived between three rooms: his personal room, the guru mandir dedicated to Paramhansa Yogananda and a small Shiva temple. About ten o’clock at night Swamiji would come out of his room and go to the Shiva temple, shut the door and remain there in meditation until after dawn. Swami Vidyananda had been given sannyas by Jagadguru Bharati Krishna Tirtha, Shankaracharya of the Govardhan Math in Puri, one of the four great monasteries founded by Shankara himself. It is the rule that a Shankaracharya gives sannyas only in his math, but the Shankaracharya had such regard and affection for Vidyananda that he came to the Puri ashram of Sri Yuketswar and in the samadhi temple conferred sannyas on Swamiji. He also broke another rule for Swamiji. A Shiva linga cannot be consecrated until it has been permanently affixed on a foundation. But the Shankaracharya consecrated a Shiva linga of sparkling white stone and gave it to Swamiji to permanently install back in the Lakhanpur ashram. From then on he spent every night meditating before that linga. Swami Vidyananda ran his school on a dollar a day. He was initiated by Paramhansa Yogananda in a ruined shack in 1935. Vidyananda would spend his meditation in samadhi. Vidyanandaji continually read my mind. He saw a disciple’s delayed arrival in his mental vision. He gave me sannyasa (monastic initiation). Click here to listen to Three Remarkable Indian Saints. The podcast length is 27:15 minutes.